With the short break in the winter weather it seems that every contractor with a pick-up truck and a bag of concrete was out working yesterday. 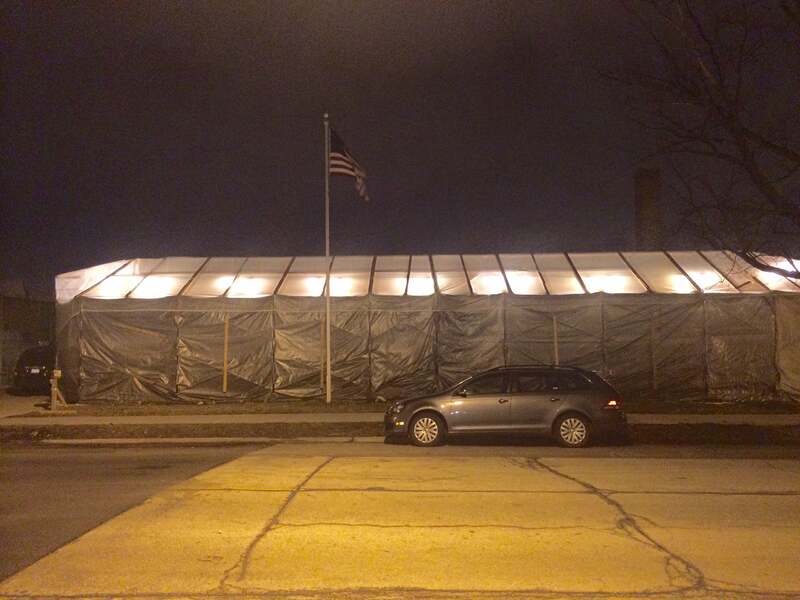 As I drove through the Logan Square neighborhood I counted seven masonry restoration projects of varying size underway. 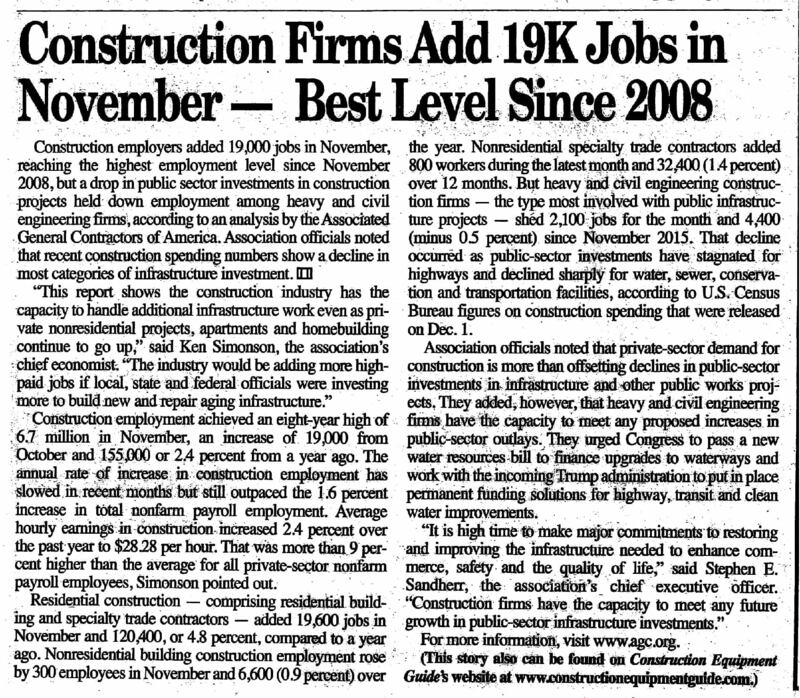 I am sure hundreds of masons were happily working on repair jobs throughout Chicago and the North Shore. Unfortunately, the forecast for the next few days is forecasted to be unseasonably warm during the day followed by plummeting nighttime temperatures in the low 20’s and upper teens. If you have been reading these blogs or know a thing or two about masonry work, then you know that fresh mortar takes anywhere from 3 to 18 days to cure properly (depending on the type of work being performed) and that mortar starts to freeze around 28 degrees. If mortar freezes as it cures, it will not perform as expected (i.e., it will fail prematurely). Since the nighttime temperatures are forecasted to be in the low 20’s/upper teens at night, all of the masonry projects I saw underway today will freeze at night and thaw out during the day. These temperature swings are predicted to continue repeatedly for the next few days. So if you are the owner of brick building undergoing masonry restoration work, the quality of your mortar work will likely be compromised…probably without your contractor telling you. The more mortar used to perform your repairs, the longer the mortar will take to cure. For example, grinding out and tuckpointing mortar joints may require as little 72 hours of above-freezing weather to cure, whereas the mortar in a 12”-thick parapet wall rebuild may require up to 18 days to completely cure. As our customers know very well, AAA-1 Masonry & Tuckpointing does not put profit over product. Your project will be performed when temperatures are safe for the mortar to cure properly. Every time. If your masonry building requires grinding and tuckpointing, masonry rebuilding, cleaning, sealing, lintel replacement or caulking, we look forward to putting our 60+ years of experience to work for you. Give us a call or shoot us an e-mail. You will be very glad you did. If your masonry wall or chimney is being rebuilt (“brickwork” as we say in the trade), then all of that fresh mortar needs a minimum of two weeks of above-freezing weather day and night in order to cure properly. If your mortar joints are being restored (i.e., ground out & tuckpointed) then a minimum of three days of above-freezing weather day and night is required in order to cure correctly. If the mortar freezes early on during the curing process, then chances are very good that it will not perform as expected. Yes it is legal to add mortar conditioners like anti-freeze to prevent the mortar from freezing and accelerants to hasten the curing process, but as far as we are concerned their use is entirely unethical since they have the effect of reducing the integrity (and therefore the longevity) of the mortar by a significant amount. How would you feel knowing the longevity of the mortar used to restore your building was reduced by 50% because the mason used season extenders?!? In the photo at rightabove AAA-1 Masonry & Tuckpointing completely enclosed this commercial building’s facade and piped in heat in order to ensure the January worksite temperatures never dipped below 45 degrees day and night. Our extra effort allowed the brickwork to cure correctly and should last for generations. Should your next masonry project extend into the colder months, make sure your contractor understands the importance of maintaining above-freezing worksite temperatures day and night. This is the latest in an ongoing series of safety-related posts. See earlier entries Part 1, Part 2, and Part 3. I was driving through Lincoln Park this week and happened to look out the passenger-side window while stopped at a red light. I saw a mason working on top of what appeared to be a 20’-tall chimney (which itself was built atop a 50’-tall building) and fumbled for my camera to capture what I saw. I had so many concerns about this mason’s safety that I parked the car, ran over to the job site, and suggested to the worker that he return to the job after he had the equipment needed to perform his work safely. He told me he did it all the time and I didn’t need to worry. Yikes, I hope he and the property owner both have good insurance (he needs it when he gets injured, and the property owner needs it when the worker’s personal injury attorney suggests suing the building owner for unsafe work conditions). Several work site safety violations scared me into action. Did you happen to notice them? Safety Violation #1: The ladder used to access the top of the chimney is not tall enough. So, simply getting to the top of the chimney and getting down off the chimney are themselves risky endeavors. Safety Violation #2: The ladder is not tied off to anything. If you look closely, the rope in the mason’s hands is for pulling materials up and down. Safety Violation #3: The worker is not wearing a safety harness with a lifeline tied off to anything secure and immovable. That means he could easily fall into the chimney shaft (likely an uninterrupted fall to the basement about 70 feet down) and break his neck. Safety Violation #4: The mason appears to be working alone. If he runs into a jam and requires immediate assistance (e.g., the unsecured ladder blows over in the wind while he is standing on top of the chimney), no one will be present to respond. 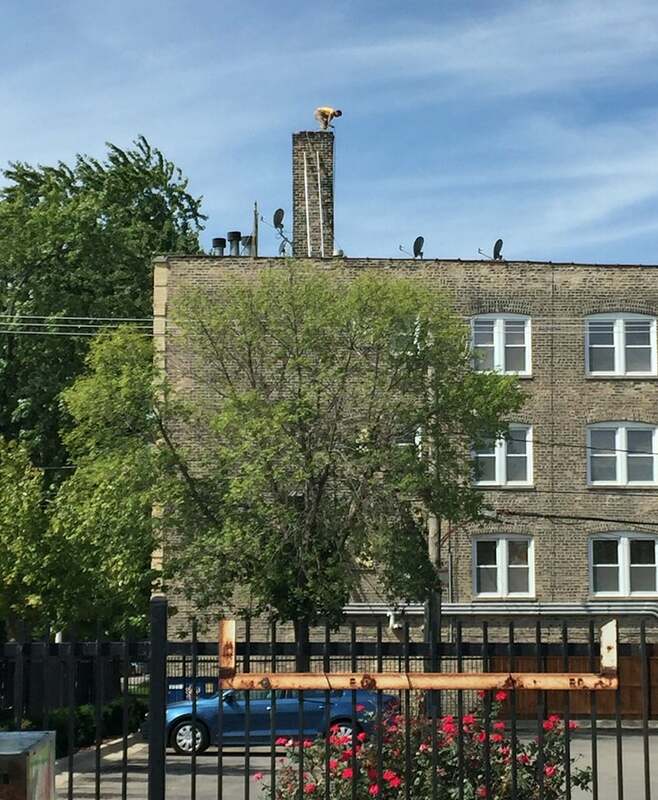 An easy solution to these job site safety violations would be to erect pipe scaffolding upon the flat roof, secure the scaffolding to the walls of the chimney using scaffolding clamps, and stand on this stable platform instead of the edge of what appears to be a 100-year-old chimney. With good training, thoughtful job site set-up and an awareness that comes from decades and decades of field experience, we mitigate work site hazards and provide you with peace of mind. Be safe out there and thank you for your support! A client whose masonry home we repaired back in 2014 recently requested an inspection of a just-constructed home in the Bell School neighborhood that he was interested in purchasing for his family. The home was really lovely, the floors gleamed, the walls were pristine, and it had GREAT curb appeal. Masonry sealers are used to provide a hydrophobic barrier against wind-driven rain. (Learn more about masonry sealers in the ‘Services’ section of the website.) Masonry sealers are critically important for newer buildings constructed with a single wythe of brick or cinder block (also known as split-face block). The term “high-quality sealer” means little in our business. Sales reps from masonry yards will tell you they only sell “high-quality masonry sealers” (why would they sell low quality products, right?) but these products do not hold up for very long against our Chicagoland wet weather events and should not be seriously considered. Eventually, the developer sent my client this promotional data sheet, which describes in more detail the masonry sealer he used. 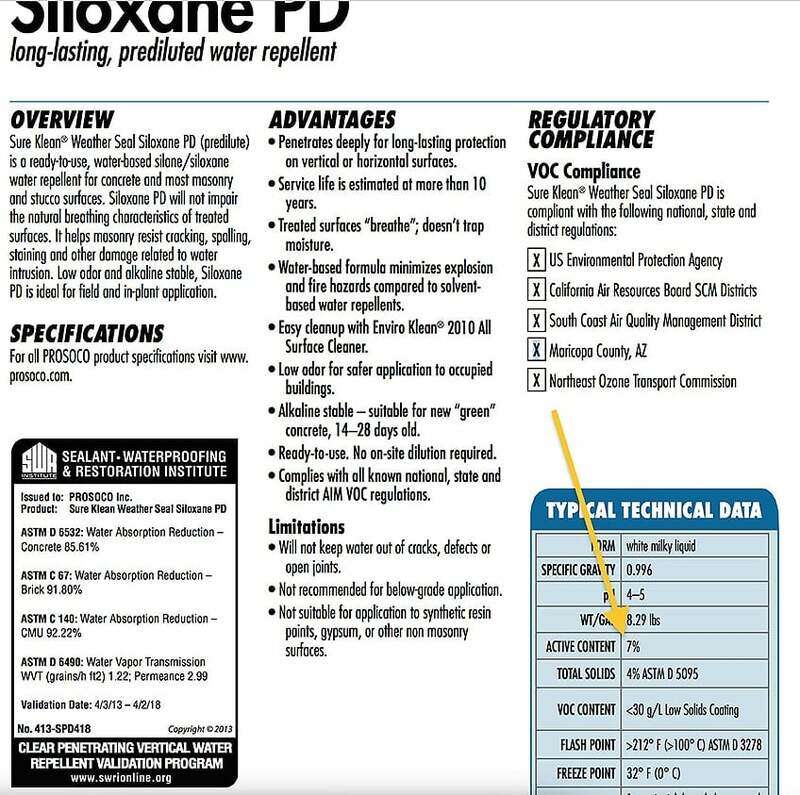 I was pleased to see that the active ingredient in this sealer was silane. Silane is the most effective substance you can apply to a masonry building, allows the walls to retain a moisture transmissivity rate in excess of 99.9% (so the walls breathe as though nothing at all had been applied), and when applied in sufficient quantity provides the very best protection against wind-driven rain events. While the percentage of active ingredient is a crucial component to ensuring a long-lived sealing job so, too, is the amount of sealer applied. There is no legal minimum application rate at which developers and masons must apply their sealers. That means developers can apply one gallon of sealer over 500 ft2 of a masonry wall and deem it “sealed,” whereas AAA-1 Masonry typically uses 1 gallon of sealant over an area more like 75 ft2 of masonry wall. I have yet to find out if my client decided to go ahead with the purchase of the home, but I hope he didn’t. If you need an honest and thorough assessment of the true quality of your masonry dream house, please give us a call.